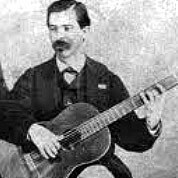 Julián Arcas was a Spanish classical guitarist and composer. Arcas was a teacher to Francisco Tárrega in Barcelona. Arcas wrote fifty two original works and transcriptioned thirty pieces for the guitar, including waltzes, variations, preludes and dances.